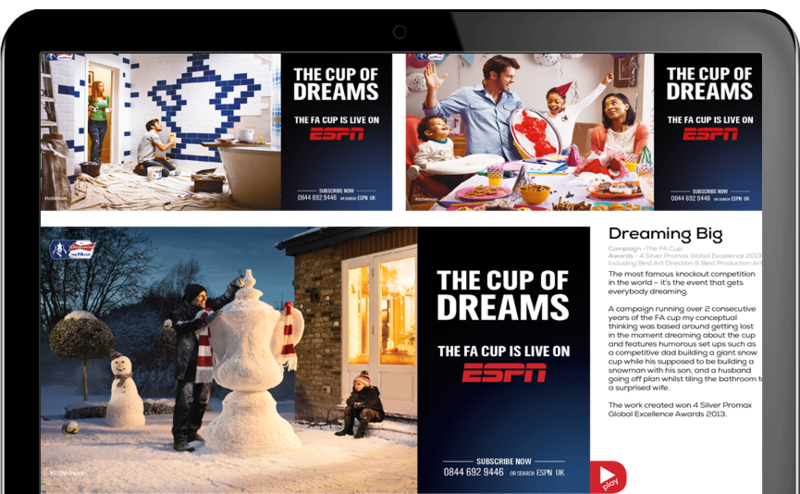 With the 2014 World Cup around the corner, ESPN were looking for a way of improving brand visibility through an innovative and forward thinking digital campaign that drew users towards their ESPNFC website. They did this by brokering a deal with TFL to provide live scores to travellers on the underground. This was the first time that TFL had licensed space on the departure boards on the underground between tubes. ESPN wanted to be able to digital mimic the side scrolling orange text of the these boards to use across a number of their sites. The key targets here were impressions and penetration. With ESPN securing the rights to broadcast on this channel with TFL, we brought this idea into a cross platform reality, from the real world onto that of their website. We replicated the departure boards digitally and created a lightweight HTML5 web-app that could be plugged in to ESPN’s own live score RSS feed. Clicking on these banners led you to the ESPNFC homepage or to the live match feed. These banners were placed strategically across the web in conjunction with the real world TFL campaign. A campaign run in conjunction with Transport for London. Live results and statements such as: Italy v Uruguay. Who will it be the end of the line for tonight? Our designs have been released throughout the 2014 World Cup on station boards and information panels, along with TFL web takeover it is the first ever campaign to utilise the stations dot matrix system. 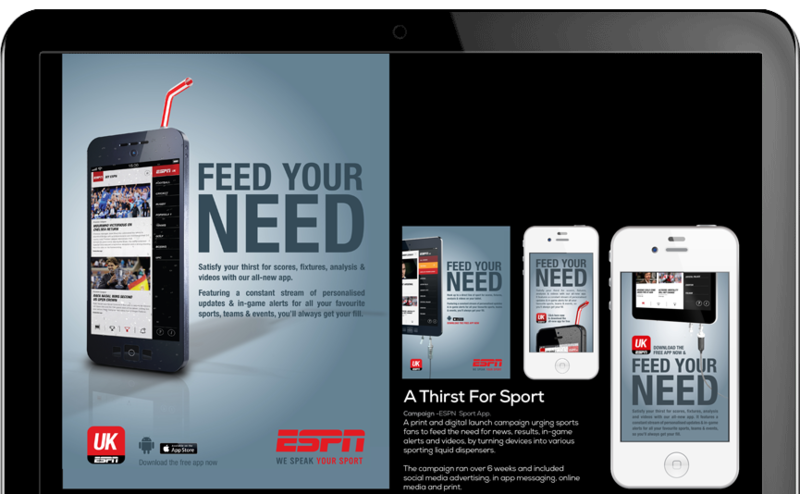 The usual mobile and ESPN site takeovers were also produced within this campaign. In terms of the campaign’s digital presence, we achieved some interesting penetration and interaction figures. With 2,851,520 unique impressions and 504,163 unique users across all ESPN and 3rd Party locations. The banner was optimised to be especially lightweight so it did not disturb the host websites functionality and performance. In conjunction with BDA and ESPN, we came up with the simple idea of broadcasting live score casts on the London Underground departure boards.